AFP contributor Scott German leads our live blog during today’s college football game pitting UVA (1-0) vs. Indiana (0-1). 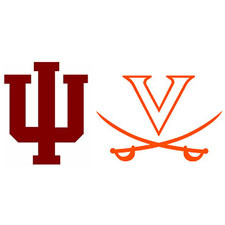 The game kicks off at 3:30 p.m.
Chris Graham and Scott German discuss the search for a new athletics director at UVA, and at the Cavs’ Week 2 game with Indiana. UVA football got out to a better start to its 2017 season than it did in 2016, beating its in-state FCS tuneup. Week 2 brings a stern test in an Indiana team that gave #2 Ohio State all it could handle for three quarters. The Hoosiers (0-1) led at the half and again late in the third before melting down in what turned into a 49-21 defeat. Don’t let that score fool you, though. The Hoosiers did some nice things against the Buckeyes. Quarterback Richard Lagow threw for 410 yards, completing 40 of his 65 pass attempts. And yeah, that’s an awful lot of pass attempts, with a run game that generated just 17 yards. Virginia (1-0), for its part, looked pretty good against the pass numbers-wise in its 28-10 win over William & Mary, allowing just 72 yards through the air, and just seven completed passes (on 13 attempts). But, yeah, you need to keep in mind that W&M came in without an established starter at QB, and that this year’s Tribe is far from being among Jimmye Laycock’s best. There is still a big question mark regarding how the Cavs’ secondary will match up against top-flight passing games, and Indiana’s numbers against Ohio State seem to indicate proficiency through the air. Pay attention, in particular, to how UVA matches up with Simmie Cobbs Jr., the 6’4” wideout who hauled in 11 balls for 149 yards last week. Expect Virginia to roll its coverages to key on Cobbs, which can leave slot receiver Luke Timian (10 catches last week) free to roam underneath. The best hope for UVA fans is that the ‘Hoos can fight fire with fire on offense. IU was gashed by Ohio State through the air (304 yards) and on the ground (292 yards). Virginia didn’t exactly pile up the numbers in the stat book, gaining just 92 yards on the ground (averaging 2.9 yards per attempt), and 354 yards total offense. A key for the Cavs will be keeping QB Kurt Benkert (27-of-39, 262 yards, three TDs) upright (he was sacked three times last week). Another key will be avoiding the turnover. Virginia didn’t have a turnover in the win over William & Mary, marking the first TO-free game for the program since 2013. Avoid turnovers, keep Benkert standing and give him some time to find his receivers, get a little something going on the ground, stifle Indiana on the ground and keep Hoosiers receivers from getting yards after the catch: there’s your formula for success from a UVA fan perspective. Date/Time Sat., Sept. 9, 2017 | 3:30 p.m.